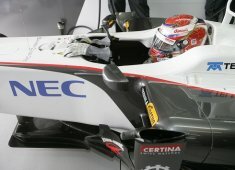 The Sauber F1 Team had an Australian Grand Prix which Team Principal Peter Sauber has called a dream start. Sergio Pérez managed to drive 35 laps on a single set of the soft Pirelli tyres, and this way made it from 13th on the grid to seventh at the finish line in Melbourne. The rookie driver was followed past the flag by his team mate Kamui Kobayashi, who had to change tyres twice and came eighth.